A contemporary villa with pool. View of the seashore in a safe residential area. Two story contemporary house in a calm and safe residential area. You will enjoy the harmonious decoration, the ample terraces, beautiful wooden deck, its 8x4m swimming pool, the landscaped garden and its view of seashore. A piano awaits the musicians and sporty types can have a go at the Provençal Golf de Sophia Antipolis green, only 500m away. Perfectly located near the protected village of Biot, you will discover the art of its glass masters, little restaurants and small alleys. For contemporary art lovers, a visit to the Fernand Léger museum is a must. A mere 5 minutes drive away from the sea and from Marineland water and amusement park, you will definitely appreciate the joys of the sea. We recommend having a look at the shops (2 minutes walk from the bus stop serving the beaches) and the neighbouring villages! A wonderful stay is within your grasp. See you soon for an amazing holiday! The bathroom has a bathtub, two dressing tables with a cabinet, WC and numerous willow baskets decorating the shelves. The other bathroom, which contains a shower and a wash table, is directly attached to a bedroom. Petrof Grand piano. There is air conditioning on the ground floor and in all of the bedrooms. During the night the swimming pool can be covered with a summer tarpaulin cover, which allows it to gain 3-5°C. Pool depth ranges from 1.20 to 1.80m. It is secured by an alarm system. This is a really lovely villa, which was perfect for our family of 5. The property is very clean, extremely well equipped with a great pool. It is very well situated with lots of places to go within easy reach and the bakery (only a 10 mins walk) nearby is fantastic. We would thoroughly recommend the villa and the owners were lovely - taking alot of time to show us everything and checking all was OK. I'm sure we'll be back! I can’t recommend this villa enough. Clean, well equipped & well located. Our 3 children all under 10 yrs loved it. 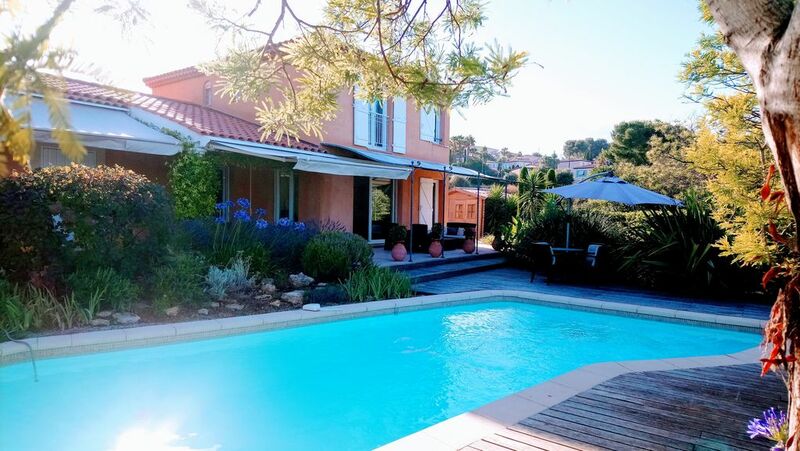 Gorgeous garden and pool, all rooms air conditioned & only 15 mins drive from airport. Huge supermarket only 10 mins drive. Lovely and quiet at night. This beautiful place it's perfect for a family vacation, we had a fantastic week with our children. The villa its well kept, very clean, and has all the local amenities within easy reach. We spent most of our time outside, BBQ and having lazy days by the pool. Short drive to Nice, Monaco, Cannes, Antibes, was our choices for a walk on afternoons and late dinner. The owners are warm and friendly people, and I have to say that we would have loved to stay longer. Nous avons passé deux belles semaines dans cette jolie maison très bien équipée et bien décorée. Tout est conforme aux photos et même plus. Le jardin nous a bien isolé des regards et avons ainsi pu profiter de la piscine à 32°C pendant de longues heures. La maison est climatisée, ce qui est un plus indéniable pendant les chaudes heures. La propriétaire nous a très bien accueilli et a pris régulièrement de nos nouvelles pour être sûre que tout se passait bien. The villa was as nice as it looked on the pictures. Unlike most properties around, there is actually a good view of the sea. Because the villa is atop a hill, the garden and terrace are very airy and pleasant. Other properties in the region can be stuffy. The owner was extremely well-prepared to welcome guests so moving in was very smooth. All the amenities, linen, towels ... you would expect and more were there. The villa is quiet but also conveniently located close to a mini-mall. We had a great vacation and are likely to stay there again in the future!